Why Choose the Pediatric Nurse Practitioner - Primary Care Concentration? Our students have had a 100 percent certification first-time pass-rate for the past two years. Most courses can be taken online. The Pediatric Nurse Practitioner acute care and primary care degrees can be combined into a dual degree, making you more knowledgeable and competitive in your field. The Pediatric Nurse Practitioner (PNP) specialty is designed to help you prepare to become an advanced practice nurse who can provide care for children from birth to 21 years. Since 1965, PNPs have worked with pediatricians and other health care providers to provide comprehensive care to children and families by focusing on health maintenance and education, illness prevention and minor and chronic illness management. This concentration provides a broad theoretical and research foundation in advanced concepts of parent, child, and adolescent nursing. Clinical experiences occur across a variety of settings and focus on providing care to well and ill children. As a PNP, you will be qualified to perform complete physical exams, take health histories, diagnose and treat common acute minor illnesses or injuries, order and interpret lab results and x-rays, manage stable chronic illness, counsel clients and provide health education. Many may prescribe medications according to state law. Coursework aligned with clinical experiences specific to specialization focus provides the knowledge, skills, and values inherent in the development of clinical excellence as a PNP. You will have course assignments and clinical experiences specific to the primary care area. You will be precepted by pediatricians or PNPs with clinical experiences in a variety of primary care settings. The concentration consists of advanced clinical practice and nursing science, built on a core of pathophysiology, pharmacology, and family-centered care. The total concentration is 45 semester hours. Primary care PNP's may practice in a variety of pediatric specialty areas, such as cardiology, dermatology, gastroenterology, and many others. Graduates of the PNP concentration are eligible to apply for the national certification exam administered by either ANCC or PNCB. National certification is necessary to obtain advanced practice licensure in most states. All students are required to complete a statistics course prior to NUR 7005: Nursing Research and Evidence for Practice course. Students can only begin classes summer or fall term. Individualized plans, including part-time, will be developed on admission by the director of the concentration. Please see sample curriculum plan for full-time student. If desired, this concentration can be designed as a hybrid concentration, allowing for most courses to be taken online. 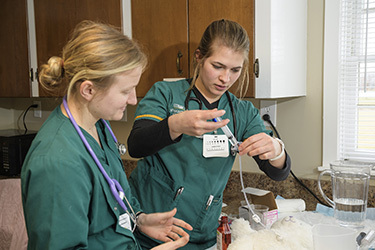 Application to Wright State University’s College of Nursing and Health is a two-step process. The College of Nursing and Health will provide instructions on how to complete the above steps once it receives notification of the completed School of Graduate Studies application. All CONH required documents should be sent directly to the CONH. Be a bachelor’s prepared nurse, having earned a BSN in nursing from an accredited institution. Hold an unencumbered nursing license. Have a minimum of two years full-time nursing experience in the pediatrics, critical care (OR PRIMARY) preferred. Degree: Earned in the U.S.
Must have an unencumbered U.S. nursing license.